Ah, the humble kick scooter. Often maligned as inefficient, or silly looking, but to those of us who know, it is the ideal vehicle for short-distance, low to medium speed transportation. True, if you need to go ten miles, then a bicycle of any type will get you there with less energy spent, and if you need to go a hundred yards, walking may be more convenient, but lets say your trip is between half a mile and five miles, well then what could be easier than a scooter? With a kick scooter, also known as a leg scooter or push scooter, You don’t have to remove your shoes and put on skates, you don’t have to unlock and lock your large, heavy bicycle, you don’t have to risk a fall from a skateboard, you just step on and go. While still in a tiny minority among human-powered vehicles, scooters are nonetheless the best choice for such distances, especially when they are highly-efficient, light-weight, quickly foldable examples, well exemplified by the truly excellent KickPed. 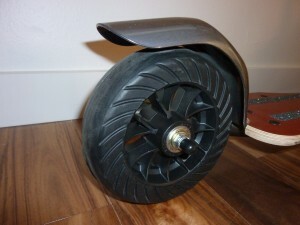 Easy to ride, as is the original Know-Ped upon which it is based, and smoother to ride on the street than the similar Xootr line of kick scooters, the KickPed is a perfect example of a well conceived design. New York City retailers NYCeWheels are not just a bike shop with a couple of scooters in the window for eccentrics and tall kids to buy, they are enthusiasts who truly understand and appreciate the virtues of scooter riding. I have owned, borrowed and ridden many different human-powered scooters in my time, and I think that to date, the KickPed is one that got it right. It’s the perfect balance of efficiency, stability, foldability and convenience. I have written many an article about scooting, or scootering over the decades, as well as several product reviews of scooters, large and small, and will try to contribute here also. Hopefully describing use and experience will help convince hundreds more to acquire a scooter and take advantage of what such a vehicle can offer. Before the Razr craze of the 1990’s I never saw another scooter rider besides the occasional small child’s toy, and a decade and a half later I am still often the only one out there, but this has nothing to do with people’s experience of scooters, which is usually very positive, it is more to do with perception. I hope to help boost awareness of how underrated scooters are as general transportation vehicles. Cycling and skating are of course great activities, but there are some things that are best done on a scooter. You must realize that every scooter rider will disagree with that! The kick scooter is a great way to get around especially in the city. And it folds up compactly so you can change over to the subway or bus without hassle. Jeffery, I really enjoyed your reviews and experience here. Looks like the last word on Kick Scooters was in 2012… can I ask if you’ve experienced any new products since then? Would you still recommend the Kickped over the Xootr or Know-Ped? I’ve read about new pro dirt scooters hit the market too. Thanks Shawn. I would say that the Xootr is only better of you stay on smooth surfaces. I was not able to do that. The KickPed and Know-Ped (practically the same as each other) are still better than a Xootr on real streets and sidewalks, which are bumpy and uneven. I now ride a scooter with pneumatic tires and that is of course a hundred times more comfortable than any small folding scooter. Shawn, I have one of the new dirt scooters from Razor. I repaced the dirt pneumatic tires with street ones from Innova. I also added an extender for the steering to raise the bars. It is amazingly smooth and efficient on sidewalks & pavement. I can pass runners on hard pack trails, but it’s a workout going 7.5 min pace. Tires pump up to 60 psi. Downsides are the lack of front brake and 3.5″ deck height. At about 13 lbs. it’s not too heavy and feels super solidly built with agility to ride alongside pedestrians. It does not fold. I agree with you that scooters are ideal for short distance commute because they do not take up too much space on sidewalks, they’re easy to carry around, and you don’t have to worry about leaving it out of your sight. Scooters have made a slight comeback in Singapore and it’s exciting to see people ride them to get around. Keep up the good work!